My suspicions came true. 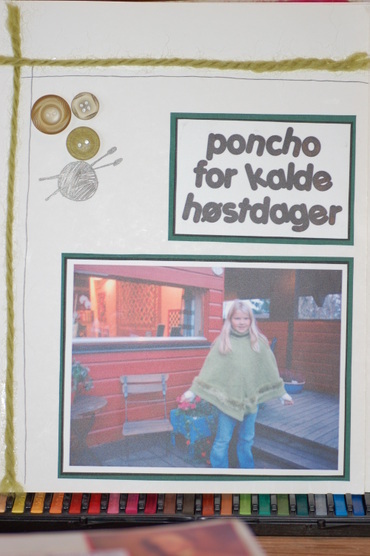 Out of the envelope floated books, images and papers......all about altered book art. Ulla, who you can get to know yourself at ULLABENULLA ,has gathered treasures for me to help me up from my crawling position to my first baby steps. And together with all the books and papers, Inspiration floated freely from the envelope (Ulla, thanks for filling it so generously). Inspiration took my hand and led me around in The House in the Woods, first to find a book to use for practice, next to show me that all the "stuff" I have collected through almost 50 years can be used. Then Inspirtaion helped me to clean a space at my desk and didn't leave untill she saw me make the first pages in my practice book - Letters of Love and Friendship. I have learned the first, most important and only rule of book art - PLAY, PLAY, PLAY, anything is allowed. I have a long way to practice before I walk this book art steady, the practice will be along the road of playing and having fun. 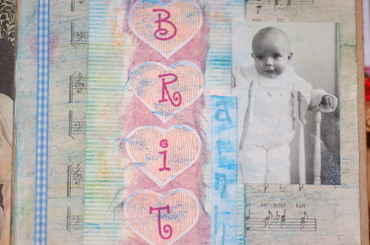 While practicing I see that I already have many books which can be called altered book or book art. I call them my "klippe og lime-bøker" (cut and glue books). Here are three samplers. 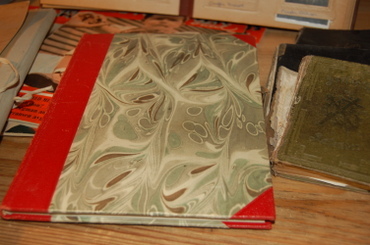 A "klippe og lime-bok" where I show parts of my collections, or themes from them. 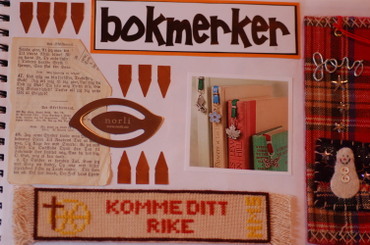 Here the theme is bokmerker - bookmarks. I haven't dated the page, but I think it was made about 3 years ago. This last photo is from a garden book I have been working on over the years. 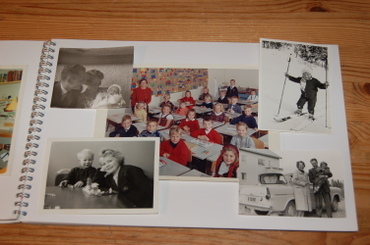 The first two photos are pages I played with last night, when Ulla's Inspiration came for a visit. First two pages........are they finished? My working desk is cleaned for anything except stuff for my altered book project. Scissors, colours and glue is ready. I read your comments once more......and I don't know where to start. Though my fingers are iching. Thanks for the copying idea. 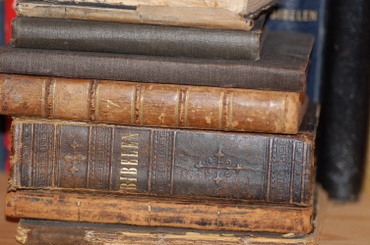 My old inherited books, though terrible worn, are too precious to use. 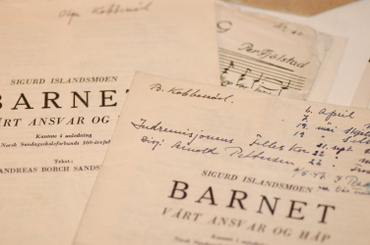 I open the file with the old religious music sheets, but even there I decide I can't use the originals. Some are duplicated. 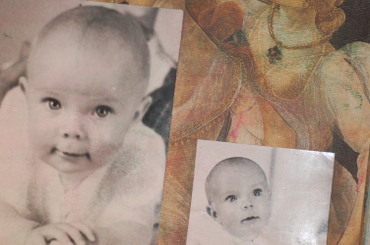 My grandparents sang in the same choir. My grandma's sheets are clean, preciously worn, my grandpa has written with a steady hand in black ink a list of concerts, dates and places. It must be where the choir sang. 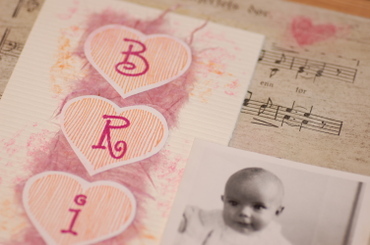 Family history in every letter. 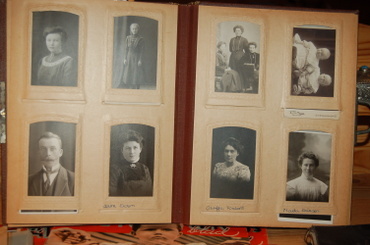 I collect some sheets and photos and will take them to work tomorrow for copying. Meanwhile I decide I need to practice. I walk through every room in our house searching for a book I can use. This is a hard part. Our house is filled with books, but I don't want to part with them.......untill I realise that this is not about parting, this is about creating, and I find an old paperback with poems and words about poets. 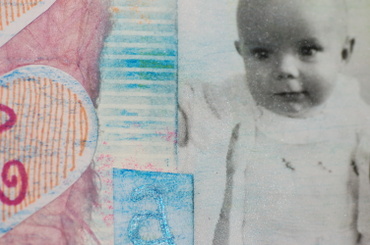 Glueing, embellishing, trying to make old look older, cutting up a birthday card from years ago, choosing baby photos of myself (for copying, I've learned this lesson.....), and a first page in my book of practice is coming alive. The name of the old song on the music sheet is "Open your heart door".......I pray that my heart door must be a door never locked. Photos: playing in my studio last night. Thank ALOT for your encouraging and helpful comments. I am really excited about this project during my 50th year. Altered Books. A Challenge. Birth Help Needed. 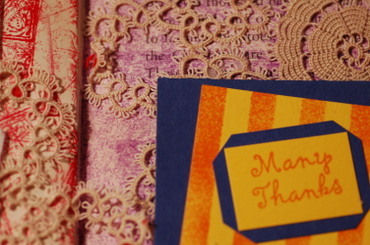 A few years ago I heard about "altered books" for the first time. At once my curiosity was tickeled, and my mind started to play with the two words - altered book........what could that be? No dictionary could give me the answer, and still, years later, I have no Norwegian word for this. 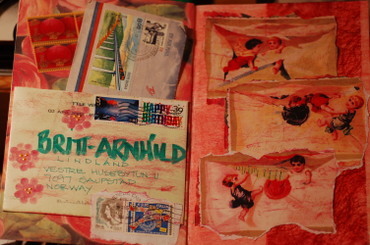 My curiosity has lead me around though, I have read about altered books, I have seen photos, I have even taken part in a project myself, by sending words and photos to an "altered book artist", dear Ardi in US. 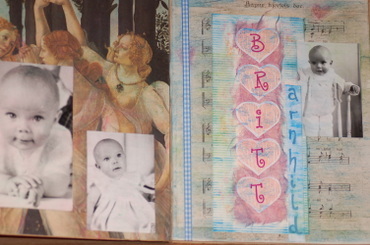 I want my first Altered Book to be a piece of art! 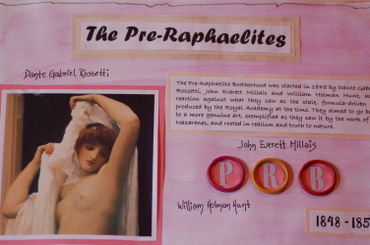 I have no idea how to make my first Altered Book a Piece of art. I can sit here untill my fingers glue together and my face turns blue......but will it help? 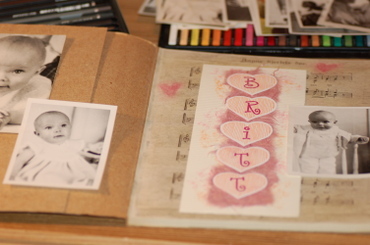 Will it waken my creative altered book muse, give her enough spirit to start working on MY Piece of Art Altered Book? I realised today that I need the help of my wonderful, creative circle of readers. Help from YOU. 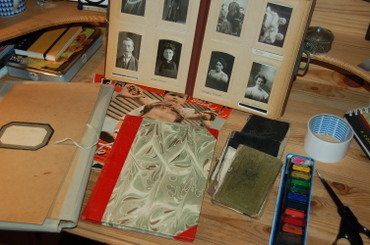 I have filled a basket with a red marbelled book from 1958 (the year I was born), a photo album with portraits of relatives long gone, a pile of magazines from the 1950ies, a cardboard file with music sheets from my grandpa Benjamin, some old worn out hymn books, old letters, glue, ribbons, colours.......... perfect stuff to make My Piece of Art Altered Book. .......BUT I NEED YOUR HELP...........ideas, suggestions, hints, help, how to start, what about the next step, where to go, theme for the book, theme for the project..............My fingers are iching to start, PLEASE COME TO MY RESCUE. 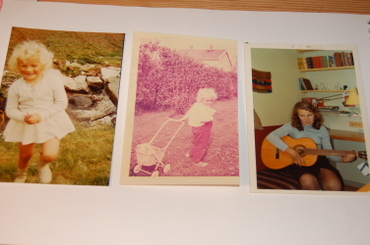 These images show a few photos from my first years. Again I need your help. How can I make a nice page, or actually two nice pages out of these photos?